We are leaving Mekah today and this is one of my best memories of Tariq and me. Picture was taken at 2am. 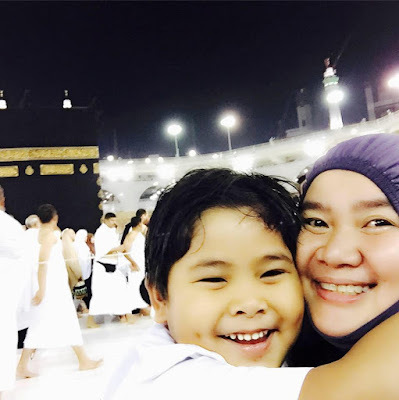 It was the first time Tariq touched the Kaabah's Wall and also see the Prophet Abraham's footstep. I had to lift him up as he was too short to see it! He also was blessed to touch the Hajar Aswad even if it's for just a few seconds Alhamdulillah! I also shared with him the story of the flood and why praying inside Hijir Ismail is like praying inside the Kaabah. He was so fascinated by the fact that there was once Kaabah has a different shape! We spend sometime repeating and retelling many Prophets stories with him. The Kaabah, the Black Stone, the Safar and Marwah, the Maqam Ibrahim, the Zamzam Well etc. Obviously, that morning he was super happy and joyful Alhamdulillah!